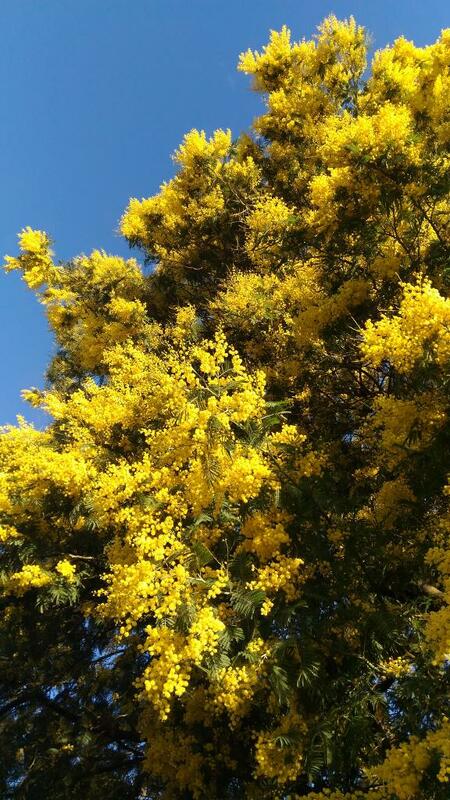 You are here: Home > Gardening > Trees and shrubs > Mimosa tree, a superb flower tree! 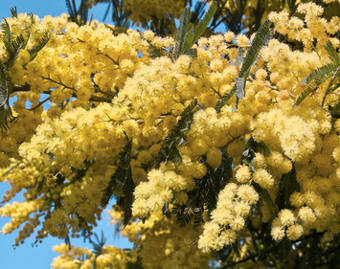 Mimosa is one of the most beautiful winter-flowering shrubs, renowned for its exceptional bright gold yellow flowering. Proper planting of the mimosa tree, its pruning and the care you’ll give it will help you have a magnificent mimosa tree, whether in pots or in the ground in the garden. Mimosa is planted preferably in spring or in fall in a sunny spot and, ideally, sheltered from wind. If you choose to grow your mimosa tree in a pot for a deck, balcony or terrace, its fragrance will spread in the entire vicinity as soon as the first flowers unfurl. Indeed, mimosa tree particularly loves sun-endowed emplacements that are protected from drafts, and especially well-drained soil. You’ll do well in avoiding heavy clay soil. 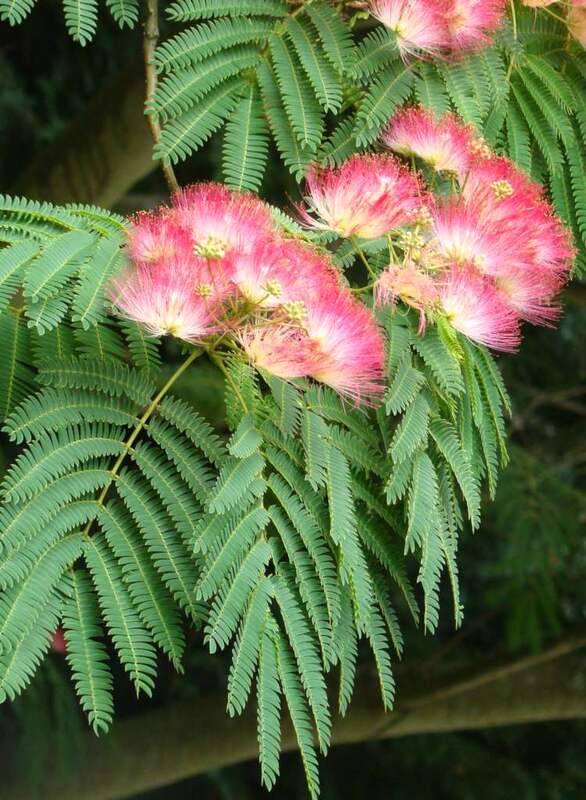 For chalky soil, select a flowering mimosa tree that is grafted with a local native root stock. It will be better suited to that particular soil type. 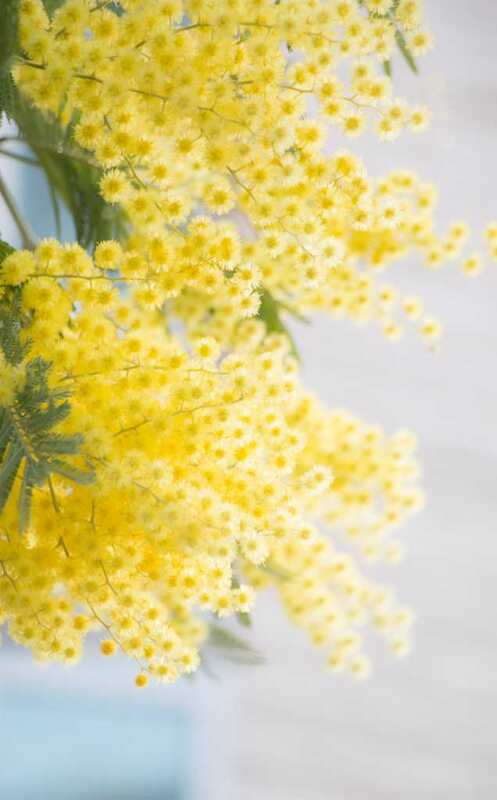 Follow our tips on how to plant a mimosa tree. Propagate your mimosa tree through cuttings in summer. You can even grow a new mimosa tree from bark. In regions with harsh winters, your best option is to plant your mimosa tree in large pots so that you may bring them indoors over winter. Mimosa is a shrub that will grow very well in a pot or large garden box, even though proper growing conditions must be provided. Never use a pot that sits in a water retention device, the pot must drain freely at the bottom for the water to run off. Start with a smaller pot for it to develop its root system. Ensure it stays sheltered from wind. Mimosa requires sun to bloom. After 3-4 years, the time has come to repot it in a larger pot. 10% river sand and for the rest, half-and-half flower potting mix and peat. 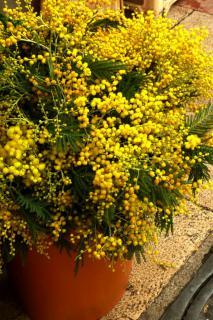 Unlike a mimosa tree that is planted in the ground, which can be left to grow freely, a potted mimosa must be pruned. The pruning is performed after the blooming. Mimosa shrubs grown in pots dry up much faster, and must thus be watered often. Water regularly but not too much, so as to not drown the roots while still maintaining constant moisture in the soil. Provide flower shrub fertilizer during the entire growth period. Or use natural fertilizer every two weeks during spring and summer for nutrients. Mimosa tree resists freezing if moderate, 23°F (-5°C) at the coldest. This is especially true when the bouts of freezing are short. A mimosa grown in pots isn’t as hardy to the cold and must be brought indoors for shelter in a cool spot over the winter if it freezes in your area. You can also put horticultural fleece to good use, wrapping the branches with the winterizing fabric at the onset of the first frost spells. 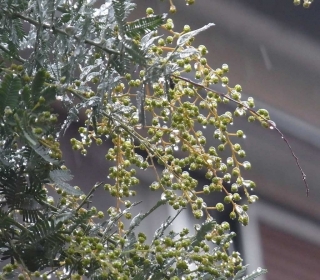 Your mimosa tree will be effectively protected from freezing. Also protect the base with a thick layer of dried leaf mulch. When growing directly in the ground and if the weather freezes deeply in your area, protect your tree by implementing our advice on protecting plants against the cold. Once properly settled in with a developed root system, the mimosa tree calls for minimal care. The only thing you might fear is having a late deep frost spell hit the mimosa tree in full bloom. Otherwise, mimosa is so vigorous that some people call it an invasive plant. But stand assured: regular care and pruning will restrain its rapid growth. Pruning of the mimosa tree takes place after the blooming because if you cut the tree in winter, you won’t have a single flower. Cut branches that have born flowers back lightly. As soon as they appear, pinch suckers off. These usually shoot out at ground level, and they’ll weaken the rest of the tree. If, at the end of winter, you notice branches that are broken and blackened because of freezing, feel free to cut them off because they, too, would weaken the tree. Mimosa isn’t a tree that requires much watering, except when potted, of course. However, it hates excess moisture that has a tendency to make the roots rot, eventually killing the tree. 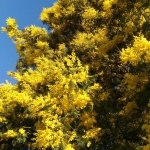 You must water in case of prolonged dry spells, but otherwise stocks of water contained in the tree itself should answer the mimosa tree’s needs. Mimosa trees grown in pots require regular watering that is moderate in quantity during winter. Only provide it when it isn’t freezing. In summer and in case of hot weather, water in the evening to avoid having water evaporate immediately. Mimosa is known thanks to florists who sell it in January, when flowers are still in the bud: it already is fragrant enough to spread its scent throughout an entire house! Its foliage is evergreen and its blooming has a fresh, appealing smell. A winter-blooming tree, it is also particularly appreciated for the color of its flowers, the fragrance they impart and, most of all, its blooming period. Winter’s deepest and darkest months is when this tree drapes itself in full color and releases its delicious spring-like fragrance throughout the neighborhood. You can also take advantage of all this tree’s gifts on your terrace, balcony or deck if you plant it in a large garden box. Simply water it as soon as the soil turns dry. Note that there is a certain confusion in terms: the tree that is commonly called Mimosa tree is actually an Acacia, whereas the tree that is commonly called acacia is really the locust tree. Now, about varieties: over 1200 mimosa tree species have been numbered throughout the world, and the first ones were introduced in Europe first along the Mediterranean, then along the Atlantic. They’ve spread across the temperate hemisphere ever since. No need to add any fertilizer because a mimosa tree never needs fertilizer, even upon planting. An exception to this is when growing mimosa in pots: the soil must be replenished. Simple mulch is enough and will keep water from evaporating and weeds from growing. Your mimosa tree will happily stay small if you prune it often, and if you let it grow it can turn into a tall tree. You omit to give the type of compost/growing medium that should be used for growing Mimosa in a pot? Hi Caroline! Sorry I forgot that – I just updated the article, thank you for reminding me! To answer your question, the best type of preparation is something that drains well. Potting mix and peat can be used to form the structure and river sand will ensure perfect drainage: 10% river sand and for the rest, half and half peat and flower plant potting mix. Add a couple handfuls of compost on top or use a natural fertilizer every fortnight during spring and summer for nutrients. Remember to water often! My poor mimosa tree looks so sad but there is still some green under the bark so I live in hope! By reading your information I realise I might have “killed it with kindness” so have decided to talk to it instead and try and get its blackened branches back to life! That’s the spirit, Janis! You’re very welcome, good luck with your mimosa tree!